"It was almost back, they had made a life out of things there. I failed to save them." Srini Vashta dismounted his Dracoth and fell to his knees, tired from the fighting and weary from seeing the slaughter and corruption. He placed his hammer on the ground beside him and unbuttoned his cloak which fluttered to the ground in a blue iridescent pile behind his back. He removed the helmet placing it beside him on the floor and stretched forward. "Now it is all destroyed again. It will take years to repopulate it and removed the rot. They don't even want what they conquered, they just wanted to destroy it. And I let them. " As Vashta bent his waist and placed his arms on the ground in front of him and stretch them forward on the ground palms down the Lord-Relictor regarded him and said, "Perhaps you should start from the beginning." "Yes, of course," the other said. His mind roiled with the memory of it. He had emerged from the Tocheforte realm gate to see the Blight moving along, the pestilential air moving in their trail rotting stuff behind them as they went. Solid, healthy trees withered, shedding their leaves, their branches shriveling and their bark peeling off as a mounted Nurgle warrior casually hacks at it with his sword as he rides past. 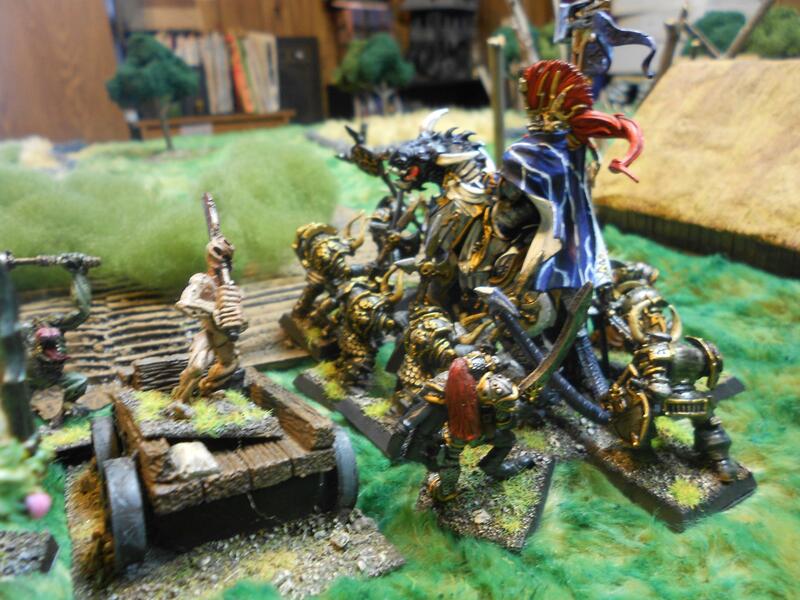 In front of him the Retributors were moving through the ruins of the ancient University towards a pustule encrusted warrior riding on a palanquin born aloft by tiny bickering daemons. In the valley he could see Warriors marching and the tribes men had gathered into two groups, led by their Shaman, to stop the foul forces from destroying all they had spent their lives building. He knew that by themselves they didn't stand a chance. 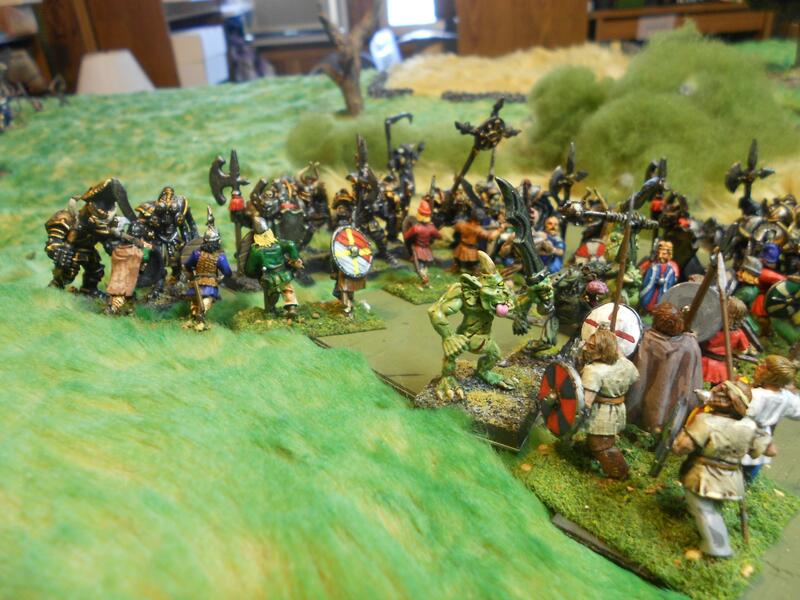 Even outnumbering the forces of chaos as they did they would just be chaff before the wind. Even with just the forces that were arrayed against them things would be tough enough. The air reeked, it was a disgusting mixture of the sweet smell of decay and vomit. The stench came in waves almost and there were more powerful hints of it. As Vashta looked out he saw a sorcerer and saw that he had summoned Daemons to the field, one of the creatures moved to his right and emerged with the Chaos Lord. 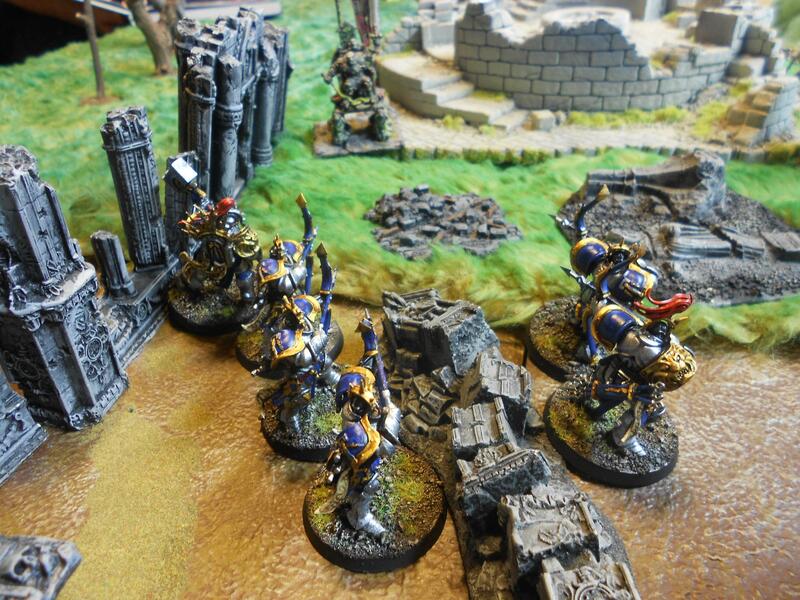 The Retributors were between them and the realm gate though so the Lord Celestant thought he might be able to turn his attention elsewhere. Gently urging the reigns up he urged the Dracoth to leap to the edge of the ruins and from there to move down the hill. 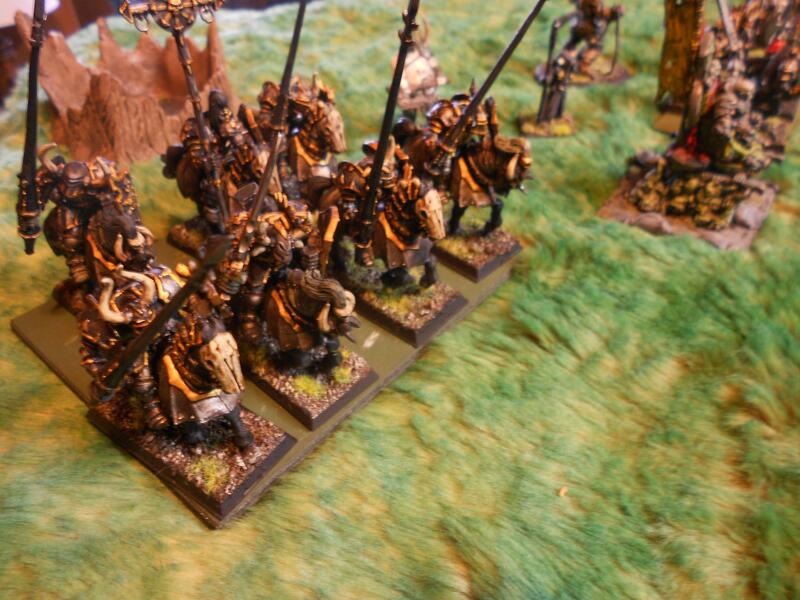 The Chaos knights had oddly moved around the tribesmen. Vashta wondered why they would avoid such an opportunity for slaughter, to leave bloated, corrupt bodies in a field like that was almost what they lived for. 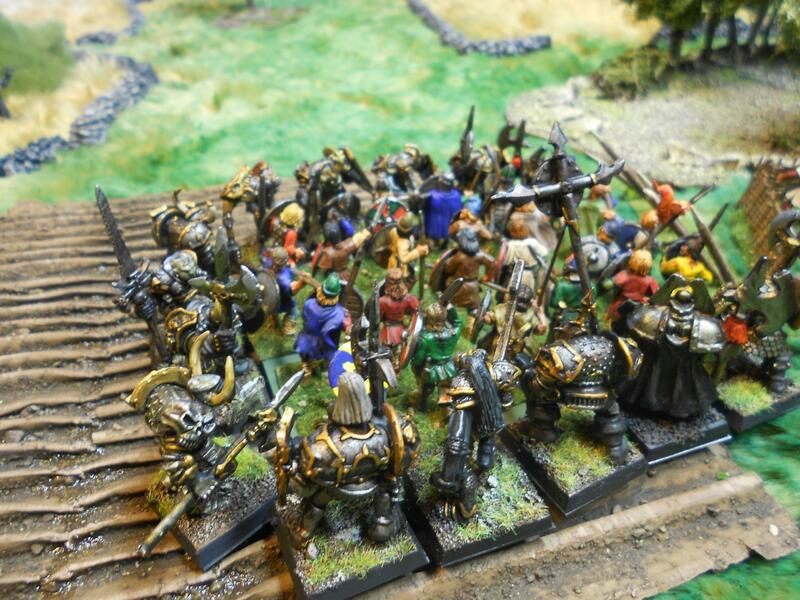 His confusion was only momentary as he saw the knights were heading for the lake. If they could plunge into that slaughtering the villagers would be unnecessary. One of their primary sources of food would be corrupted. The putrescence would spread throughout the whole lake if those knights could get in there. He moved to intercept them. 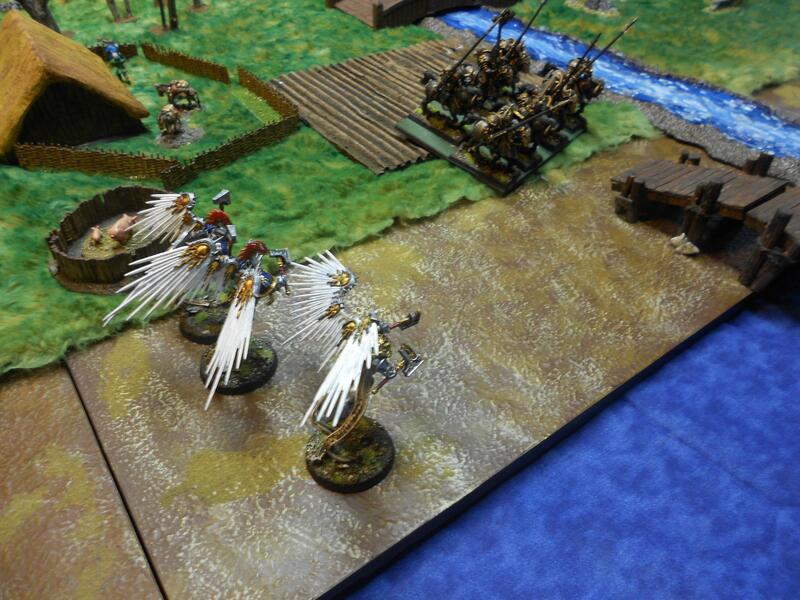 More Sigmarite forces emerged from the realm gate as their Lord Celestant moved towards the knights. 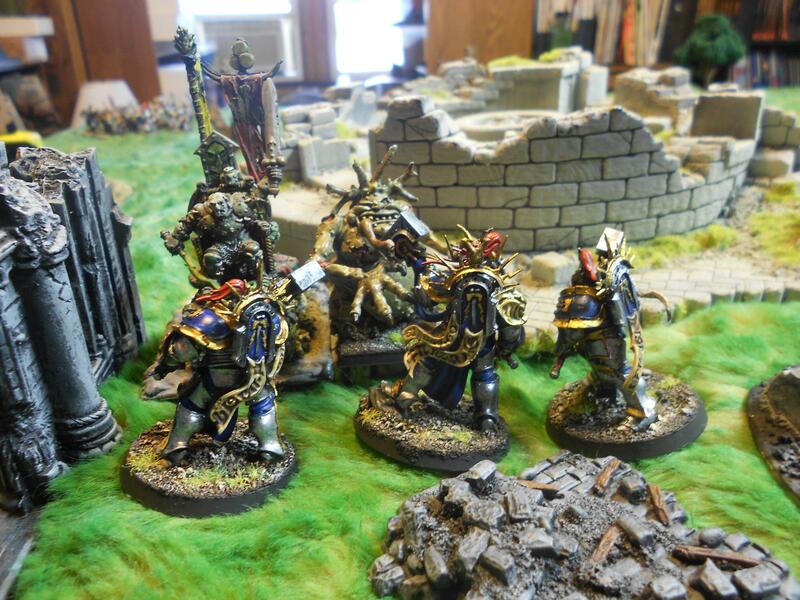 The Retributors were now involved in toe to toe battle with the Chaos Lord and a herald of Nurgle. As hammer blows landed on the soft flesh of the bloated creature, rotting entrails caught the hammers as they were being withdrawn, forcing the warriors to snap the tubes and spill the putrid contents out over their gleaming weapons and steel covered forearms. The Nurglings had place their lord's Palanquin on the ground now and were skittering between the feet of the Retributors, clawing at them and scampering up legs, distracting the warriors from their attacks while the Lord himself swung his sword to the left and right, the rusted blade dripped with poisonous pus and it dented Stormcast armour. One blow from the Retributors smashed the arm off of the Daemon they were facing and another tore open its torso spilling rotten bowls upon the ruined stones beneath their feet. Even with the ground slick with the foul almost liquid entrails an Eternal managed to land a third blow directly on top of the hellspawned creatures head slamming that part into the now nearly vacant torso and ending the existence of the creature. 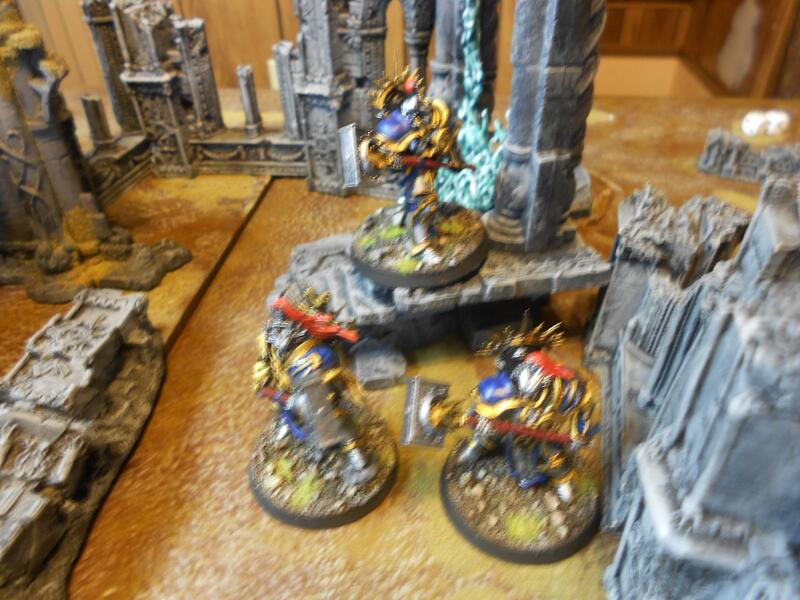 The Lord sliced at them still though and one Retributor crumpled to the ground as the plaguesword bit deep into the gap between his breast plate and the armour of his upper arm. It punctured the arm pit and came out through the back plate which corroded around the gash. 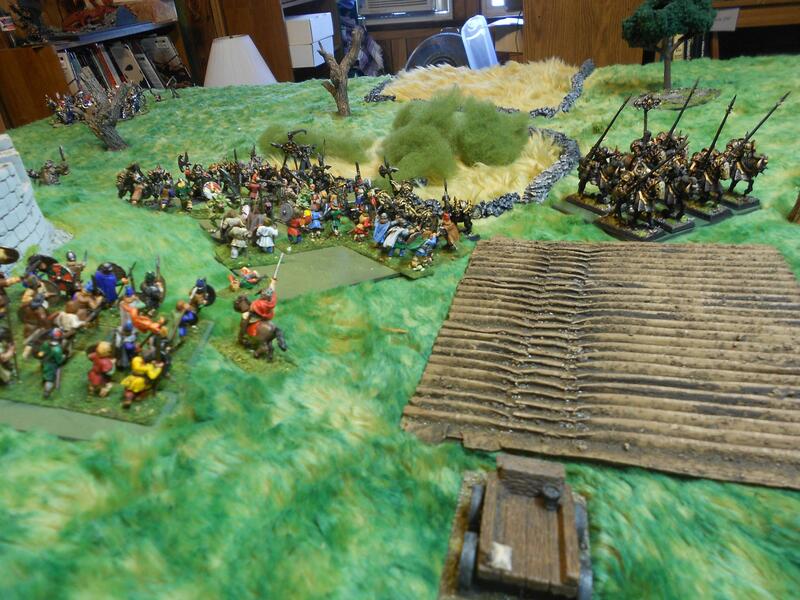 To save their fields the brave tribes men blocked the path of the daemons and charged them. For amateurs they did fairly well, slashing and swinging their swords. But their opponents had been created to kil, they lived to slaughter. With the stench of death about them the Nurgle daemons plowed into the enemy and although some of their number fell, the forces of Chaos gave much better than they got. 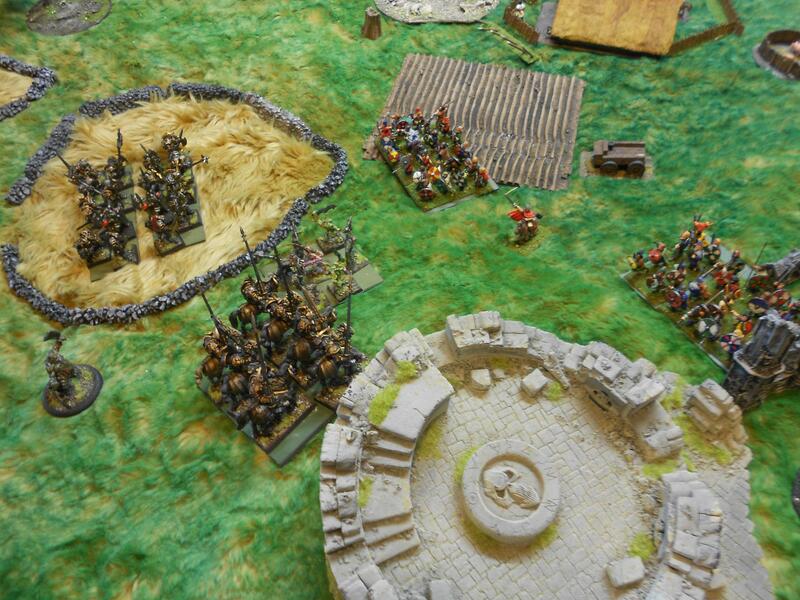 The Warriors then charged into the tribesmen and heavy blows fell amongst the farmers-turned-fighters. Their plowshear spears were not enough to protect them and those that were not killed quickly ran away. 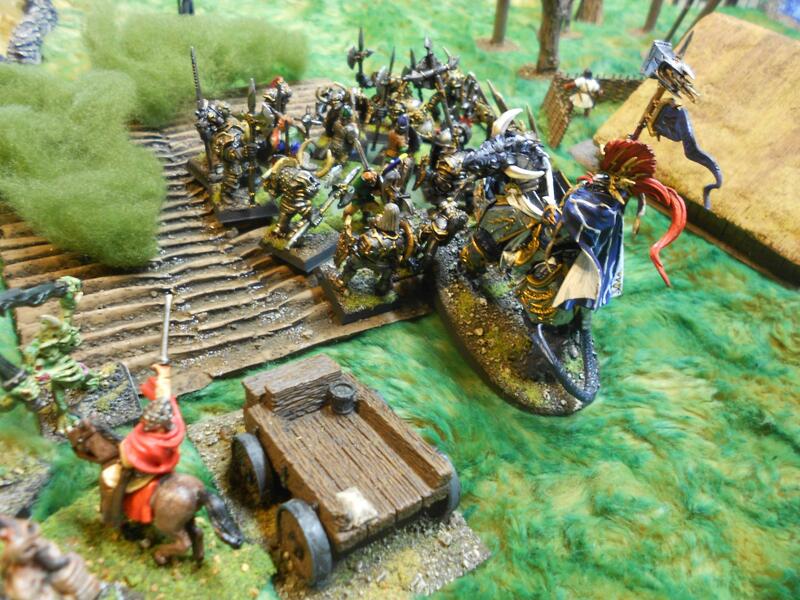 Still the other band of warriors did not falter and stood their ground even as the warriors of Nurgle's putrescence leaked into the ground around them, stilling the life of the seeds just planted and fouling the pools of rain water than had gathered in the field overnight. 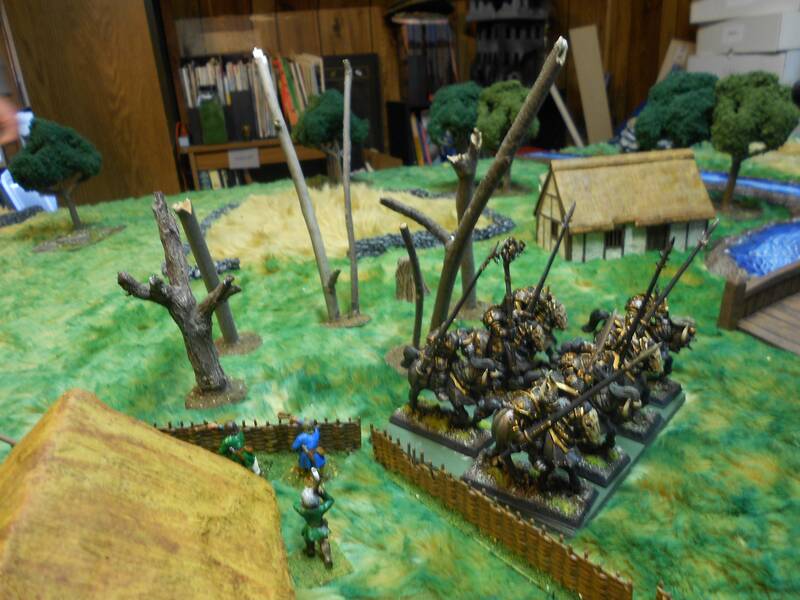 The men held their ground as the Warriors advanced on them. Soon the slaughter started in earnest and after the initial onslaught half of the tribal forces lay dead in their field. 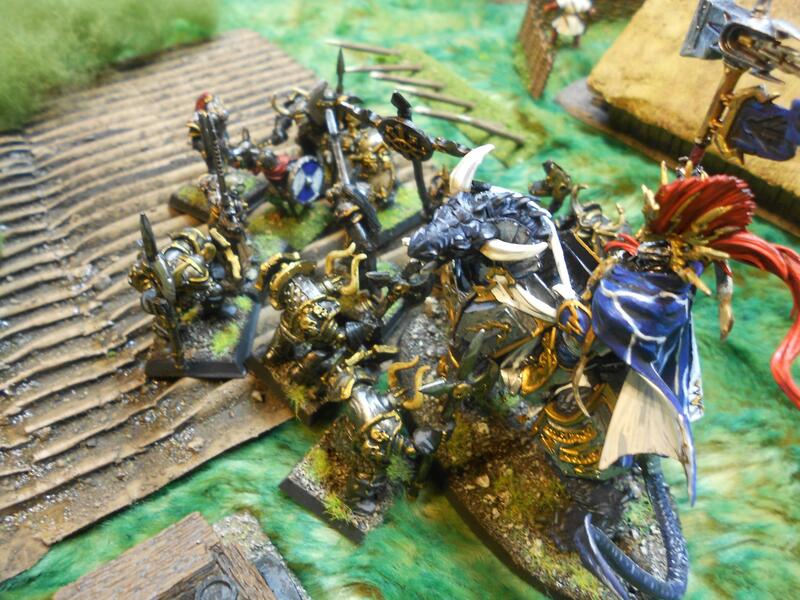 Vashta could not ignore this, his mind told him he had to stop the knights but he heard the calls out from these poor men who were being slaughtered and turned his Dracoth towards the fight plowing into the Nurgle warriors, trying to cut his way through to the few men left alive. 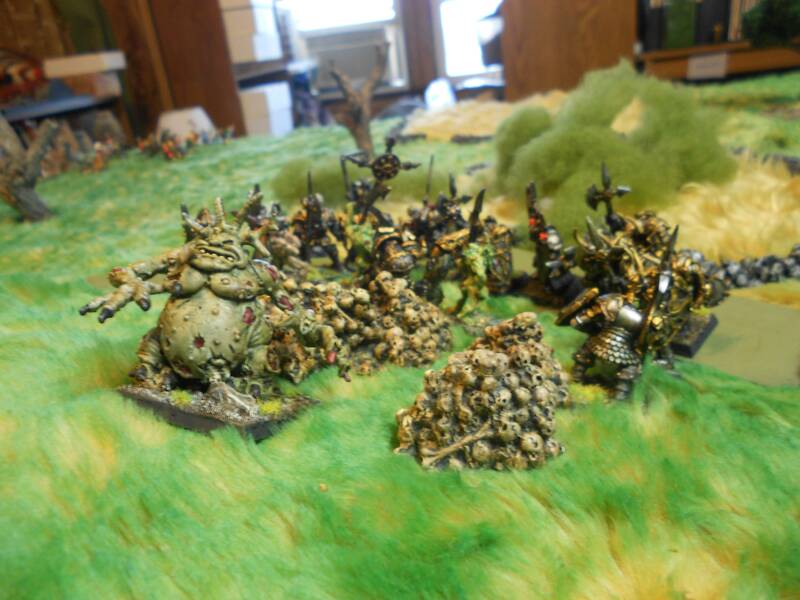 More Nurgle forces moved towards the Realm gate while others spread out through the fields and woods corrupting the very vegetation with their befouled touch. The Plaguebearers encircled the leader of the mortals. The Sigmarite shaman fought bravely, his blows would have felled mortal men, but where they struck they sloughed off decaying flesh and did no real harm to the chaos-borne monstrosities. He danced his horse away from their blows and parried what he could but each parry caused his weapon to rust a little bit where it contacted the chaos blades. One slash cut through his horse's rear leg and it staggered. He jumped clear as the horse collapsed, the sickness spreading unbelievably quickly through the mount's body. And he fought them on foot, soon he was down on one knee, blood flowing out of two serious wounds. He could feel his heart beating faster and faster as it tried to oxygenate his body with less and less blood. The plagubearers had wandered away from him to join in slaughter elsewhere, he looked as his hands turned black and the flesh started to wither away from the bones and then he could see no more. Vashta was not able to save the men, the last of the warriors was pierced by a half dozen blows and fell, he swung his hammer pushing the warriors back now. He turned to survey the field in the few seconds he had bought himself. He could see that the last of the Retributors had fallen back from the Nurgle Lord and that the Judicators were desperately firing arrows at that unhallowed creature. Prosecutors were swooping towards the knights who were nearing the beach now. He uttered a prayed to Sigmar that they would be in time and that was all he could do before the Nurgle warriors were upon him, hacking and slashing ferociously with their pus-befouled weapons. The Dracoth tore one of the warriors nearly in half with its claws and his hammer smashed into the shield of one of the warriors hard enough that the shield itself was forced into the torso of the wielding warrior. He backed up now, the Dracoth leaped towards the lake, the warriors could not keep up, but he could see now that it was too late. 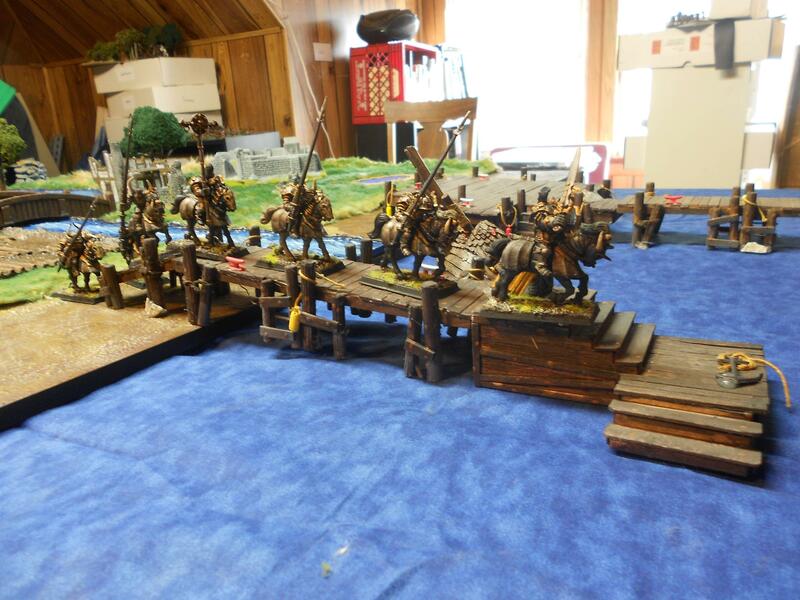 The Prosecutors had not intercepted the mounted Nurgle warriors and they charged headlong down one of the piers and into the depths of the lake, each one plowing into the fresh water in a different direction, the filth pouring out of the joints in their armour. With the sky a clear blue the lake reflected that but from the Nurgle warriors a sickly green colour spread in the depths and moved through the clear lake turning its waters undrinkable. He saw one of the warriors pull his helmet off as if to cool himself off, but instead of taking a gulp of the water he emitted a black cloud of flies out of his gaping mouth. Vashta ordered the Prosecutors off. "Form on me, head for the realm gate," he screamed. The Dracoth bounded forward and up the hill towards the ruins. The Judicators were beset by the forces of Chaos up there, one was already dead. Vashta grabbed one of them and pulled him onto the Dracoth behind him before leaping through the Realm gate, the prosecutors followed his example and each pulled a Judicators out of harm's way on the fly before deftly folding their wings and plunging through the realm gate after their lord. This land was in the domain of Nurgle. Brilliant stuff as always! 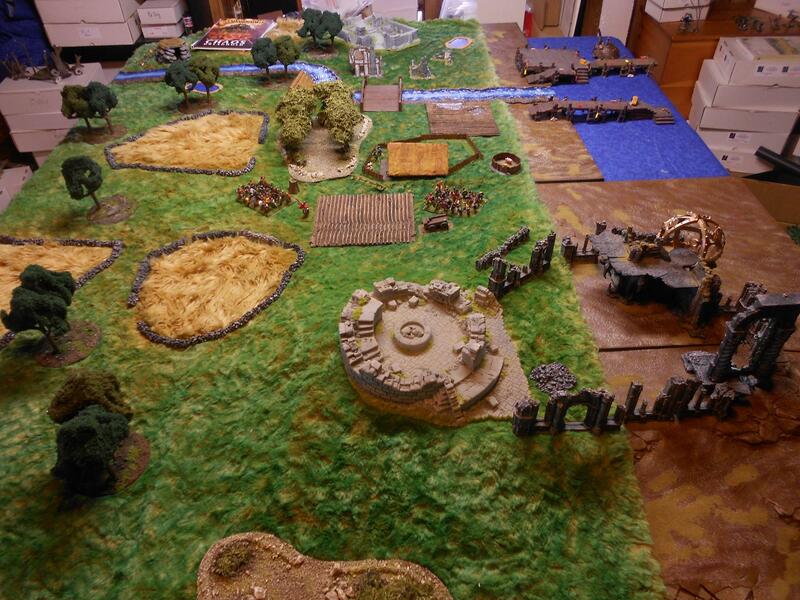 I really like the way you combine several styles of terrain boards to make a bigger scene as well. 1) Secure the realm gate. To do this they had to have a model move within 3" of the opening thus denying entrance to the Eternals. This goal was not accomplished, the Stormcast held the gate at the end of the game. Worth 5 VPs. 2) Slaughter all of the "normal" people. If they do it is worth 5 points, if they kill more than half 3, if less than half 0. The reverse was true for the Stormcast. So if less than half were killed it was worth 5 points. 3) Corrupt areas of natural terrain. The fields counted as Natural terrain. 1 VP for each piece corrupted for Nurgle 1 VP for Sigmar for each uncorrupted. There were 17 pieces total. 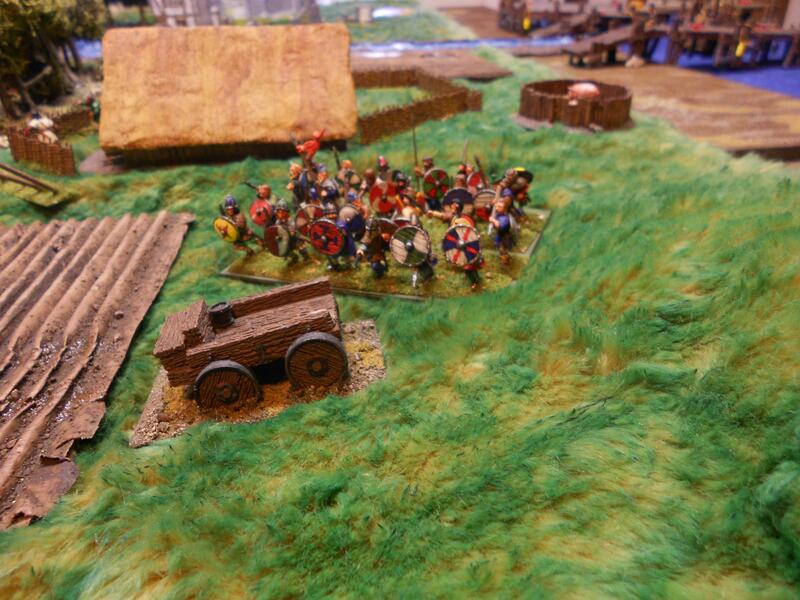 4) Get a unit into the lake. If Nurgle can spread his plagues to the lake then the fishing village is pretty much done. If a Nurgle unit gets into the lake it is worth 10 pts as long as the unit is over 5 models, if less than 5 models or a hero character it is worth 5 pts. 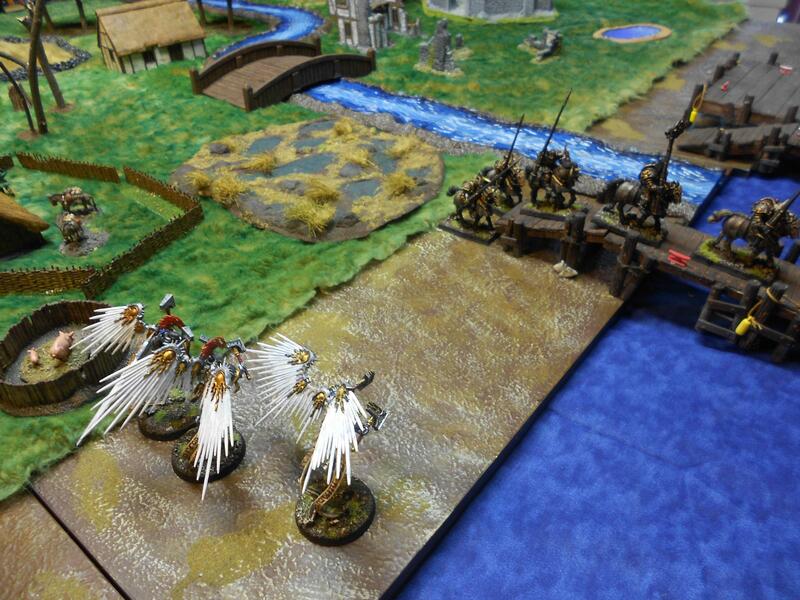 If a unit over 5 models or a character can get into the river at least it is worth 3 pts. Eternals score no points on this, they just deny Nurgle points for not letting it happen.